Drivers using the M27 in Hampshire today are being advised to plan ahead, as repair work following a collision this morning means that delays to journeys are likely. Lane 3 will remain closed in both directions on the M27 between junction 5 (Eastleigh) and junction 7 (Hedge End) in Hampshire following a collision this morning. Around 400 metres of the central reservation barrier was demolished in a collision at around 7am this morning, which involved an HGV. The Highways Agency and its contractors are working hard to reopen the lanes as soon as possible, but due to the damage it is unlikely that the repairs will be completed until the evening. 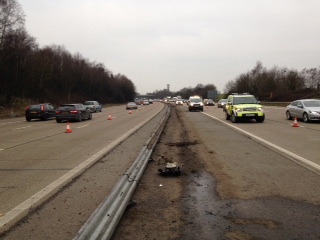 Once the vehicle has been recovered, around 64 new posts and 124 sections of barrier will need to be installed. Drivers are advised to plan their journeys and allow extra time; delays peaked at 90 minutes for westbound traffic and 60 minutes for eastbound traffic this morning. I trust no one was hurt. It seems every day now we get a prang on this overloaded motorway, with mega more traffic planned for it if all the planned homes are built!! I knew something had happened on the Motorway, as there were long queues through Hedge End this morning. I walked down St Johns Road faster than the traffic was moving, though it was moving so not completely gridlocked.. I bet this situation (which happens quite often) could be improved by easing some of the old traffic calming measures. Re-opening the top section of Botley Road for instance, past Hamble Motors & the Ambulance station. That’s not such an issue now, as there’s a 40mph limit on the A27. It was decontrolled back in the 70’s, when that closure was implemented…. A significant event, but events like this on our motorways are becoming a daily occurrence it seems. travelling anywhere by car during “rush” hour is a scary, frustrating and time consuming affair. One that is only going to get worse without a radical rethink on travel policy especially in light of all the additional housing being built in eastleigh. Our roads cannot cope now god knows what they will be like once the developers have their way. Go on then. What’s this got to do with the M27? Busy elsewhere atm. Can’t do it all, I’m afraid. Not sure what you mean by entertainment.